Posted on 28 January 2012. The Fighting Scots broke in the College’s new indoor track last Saturday, hosting the Yeomen of Oberlin College in a closely fought dual meet. The inaugural competition showcased the speed Wooster’s runners will bring to NCAC opponents throughout the season. The men’s team dominated in sprints, finishing first in the 60m, 300m and 500m. A depleted Oberlin squad declined to compete in the latter event. However, they ran unopposed in the mile race, highlighted by Stephen Williams’ quick time of 4:32.93. The Fighting Scots excelled in the 3000m, taking three of the four scoring positions. Luke Hutchings-Goetz ‘14 paced off Oberlin’s Matt Bernstein until about four laps to go, pulling ahead to win with a final time of 9:13.65.
m score of 64 to Oberlin’s 73, but came away with a positive feeling about the new Scot Center. 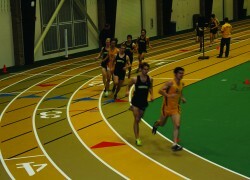 “The track is such high quality you don’t even realize it’s indoors,” remarked co-captain Casey Green ’12. Green was part of a packed 1000m which, despite ceding first and second place to Oberlin, featured a tight pack of Wooster runners finishing 3-8 in a gap of less than nine seconds. “With the spectators watching and the general excitement, it really added to the energy and made for a spectacular experience,” added Green. The women’s squad stayed on par with the Oberlin athletes throughout the afternoon. Individual wins included Stephanie McShane ’13 in the 60m, Amy French ’14 in the 60m hurdles and Meredith Shaul ’12 in the mile. Field events noticeably contributed to the team effort, with Wooster notching wins in high jump, pole vault, triple jump and a close match in the long jump. Ellen Sandin ’15 sprang a little over half a foot farther than Oberlin’s Marissa Clardy and Melissa Elie to a final distance of 15 feet six inches. The women’s team combined to score 74 points, just one shy of Oberlin’s 75. The Scots will host the NCAC Quad this Saturday, with field events beginning at noon and running to follow two hours later.